Now if you're flipping through Betty, you won't find 5 Bean Chili and Spicy Southern Style Cheddar Corn Bread. What you will find is recipes titled : Family Favorite Chili and Cheesy Mexican Corn Bread made Southern Style. Why'd we change it? 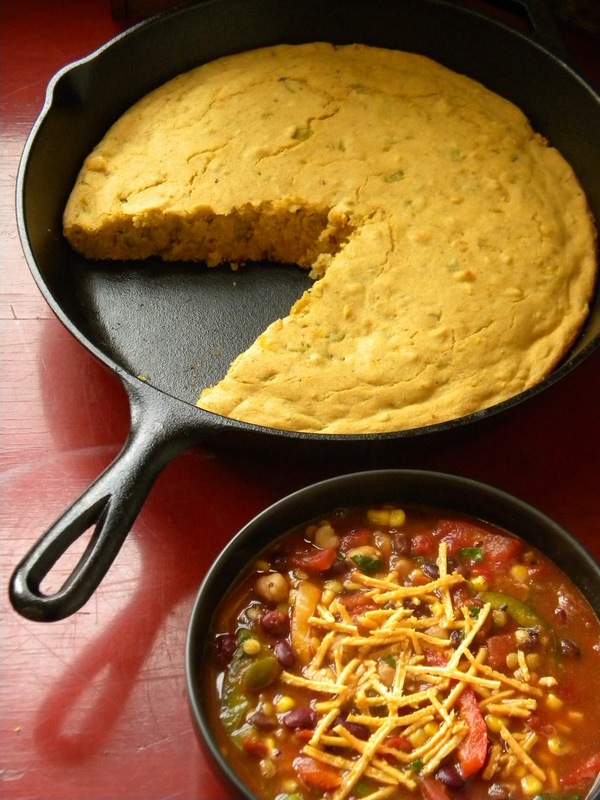 Well, because this is the recipe for our family favorite chili and this corn bread (like many Betty recipes) is kinda more Mexican themed American food. I love Mexican themed things but I know that some of you are reading this actually in Mexico. So I figured I wouldn't confuse you with a claim that wasn't really spot on. See what we call Mexican corn bread in the US was actually invented in Texas by soldiers in the 1800s as a way to doll up a fairly cheap food. Corn bread was really popular during the Civil War in the South because it was so cheap to make, filling and didn't get stale as quickly as white or wheat breads. Since then it has earned a distinguished spot in Southern cuisine and reinvented numerous times into fritters, hushpuppies and what have you*. 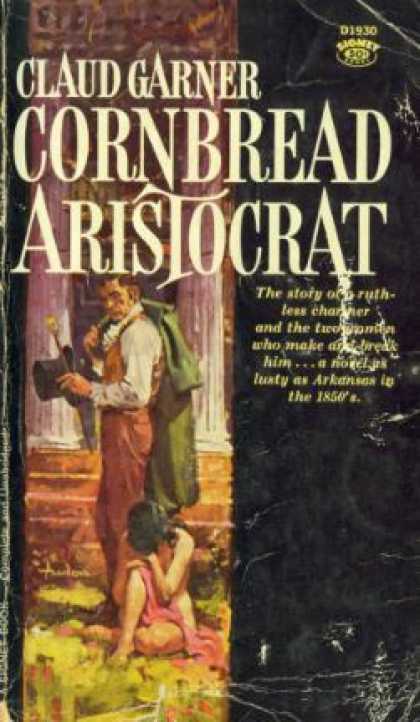 Now the technique of baking your corn bread in a cast iron skillet is a Southern tradition and according to my copy of Betty's Big Red has not been through The Betty Crocker Test Kitchens. Also - we loved it. The crust it creates is actually my favorite part and the presentation is pretty cool too. 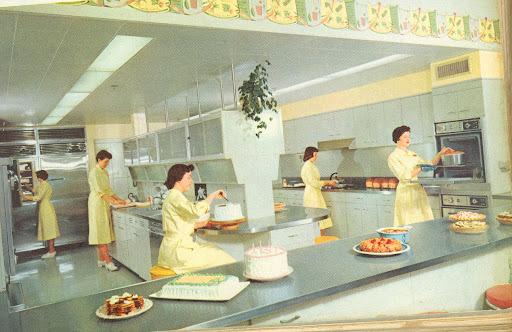 Question : Am I the only one out there that dreams of being invited to The Betty Crocker Test Kitchen - all Willy Wonka style? Like one day I'll open a box of Bisquick and find a red ticket! Dan will jump out of bed in his old timey nightshirt and dance around the room**. Then we'll head out to Minneapolis, MN where Betty Gnomes are hard at work creating the American dishes that inspire our little project using 93% perspiration, 6% electricity, 4% evaporation, and 2% butterscotch ripple. SIGH. Well, a grrl can dream can't she? Until my ticket comes in, let's eat some chili! These pictures didn't turn out that great... I miss our old camera. 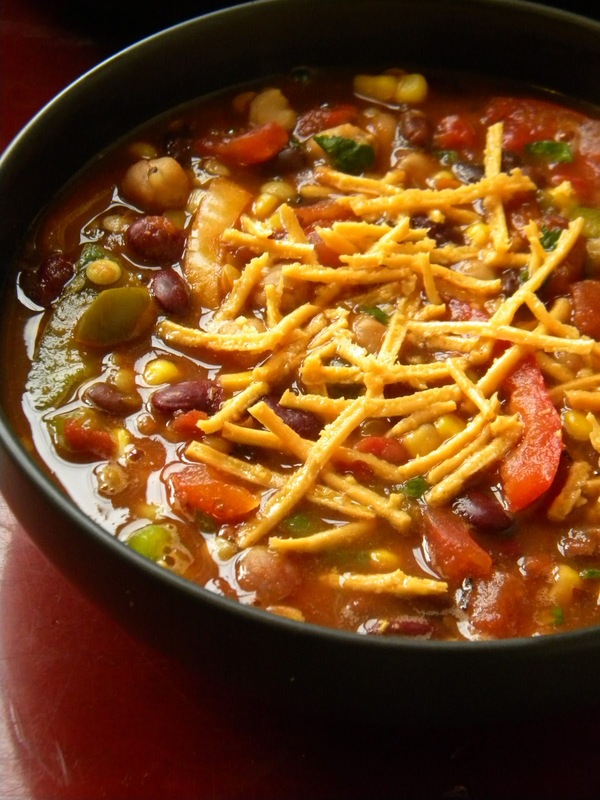 Add all your ingredients except the Daiya to your slow cooker and set it on a low heat. Cover and cook for 5 to 6 hours. Stirring occasionally. If you don't have a slow cooker, you can use a large stew pot and cook covered on a medium heat for 5 to 6 hours. Be sure and stir it often. The Beans are more likely to stick to the sides in a stew pot. When you serve - sprinkle with Daiya and don't forget your corn bread. Grease your darling cast iron skillet with Vegetable Shortening. Put the skillet in the oven to heat up. In a large bowl, stir all Ingredients until well mixed. Then use a hand held mixer and blend for another 30 seconds on the highest setting. Then carefully pour into your pre-heated skillet. As it pours into the hot skillet it will sizzle and bubble. 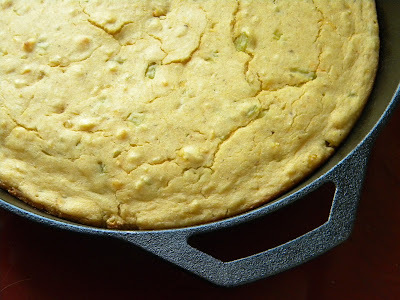 With a wooden spoon or spatula - spread the Corn Bread out to make an even layer. Then bake for 20 minutes in the skillet or until the top is golden brown and you can remove a toothpick cleanly. You want to serve it warm but it'll still be good room temperature the next day with your leftover chili. **Dan doesn't wear nightgowns to bed but I feel it's an important element of this dream sequence. I am so excited that I found your web site. I saw the article in VegNews. 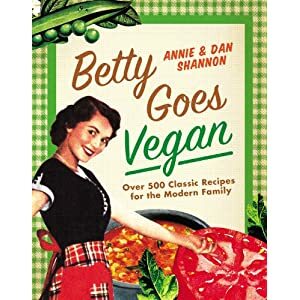 I would totally buy a cook good of Vegan Betty Crocker. I am excited to look around the site and find recipes that I can make for family! I have been veganizing my own recipes and am happy I have a go to site I can look up to see if you have already done it! Good lord, I want that!